Shown with optional 3rd and 4th Camera Link connectors and TX2 module. 1390 megabytes per second data transfer rate. Two 26 pin MDR Camera Link connectors for up to Base cameras or one 80-Bit, Full, or Medium cameras. Add the optional bracket with two additional MDR connectors and internal cables to connect a second 80-Bit camera, or a second Medium or Full camera, or a third and fourth Base camera. Supported by XCAP-Lite (no charge with board purchase), XCLIB, and XCLIBIPL. Monochrome or Color 1280×1024 500 fps 8-Bit CMOS 12 µ 2 1.25 Mpixel Global Shutter. Monochrome or Color 1280×1024 500 fps 8/10-Bit CMOS 14 µ 2 1.25 Mpixel Global Shutter. ISO 2500 (Mono). NAC HotShot 1280 CL Monochrome or Color 1280×1024 500 fps 8-Bit CMOS 12 µ 2 1.25 Mpixel ISO 400 (Mono). 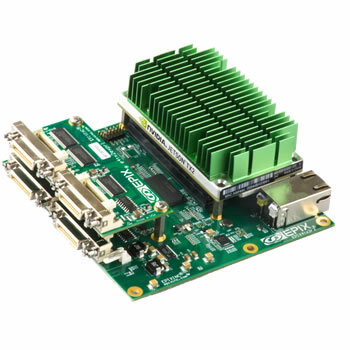 The chart lists high-performance cameras that showcase the PIXCI® E4TX2 board's capability to transfer massive amounts of image data which translates into the ability to capture high resolutions at comparatively fast frame rates. The PIXCI® E4TX2 is primarily designed to support high performance cameras, but it also works with virtually ALL camera link cameras.